While browsing one of my favorite blogging sites, I found a few pictures I thought would be interesting to include on our class blog. They depict male superheroes as though they were female. Some of them, in my opinion, were drawn very tastefully, and exactly what you would think the "female" version would look like (without being objectified or sexualized). Some of them, however, seem extremely sexualized and barely clothed. The versions of Batman, Superman, Captain America, Spiderman, and a few of the others are mostly just wearing the same costume as the men with breasts and slightly different muscles. Some of the other ones, like Green Lantern, are barely covered. I'm not really sure why these superwomen were drawn, but they are very interesting to think about. Why wasn't Wonder Women drawn like this female version of Superman? Why wasn't Batwoman drawn like this version? One could argue that their actual costumes give them a different identity than just the female version of said superhero. However, could their costumes have been drawn similarly to these -- as in, not provocative? Most likely. These depictions are quite interesting, though. What do you all think? 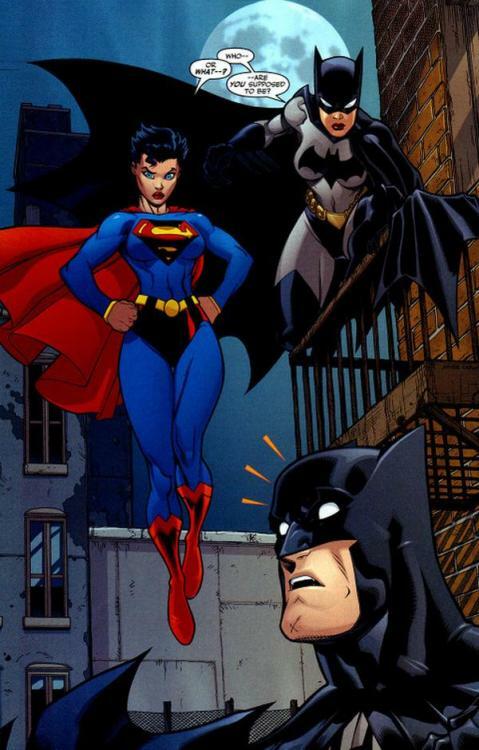 I really like the picture of Batwoman and Wonder Woman. It's interesting to wonder about whether the comics would have sold as well as they did if the female leads were drawn looking more like the males. They are much more covered and less sexualized. I personally like the outfits better this way. I agree that it would be interesting to see how comic books with more conservative versions of superheroines would sell. It would be cool if newer versions of Wonder Woman were created in this way so that we could compare the popularity of the new and old versions. I think that William Marston's idea of Wonder Woman might have been influenced by Superman, but we talked about him wanting Wonder Woman to be a different woman with values and strength. I think his point was to be similar, but still noticeably different. And the same for Batwoman, her childhood slightly resembles Batman, but her personality is still her own and I think J.H. Williams III wanted Batwoman's personality to be unique. Or else, they wouldn't get as many readers because it would be hackneyed. I agree that the different costumes do give superheroines more of a separate identity from their male counterparts. If Batwoman, for example, had the same costume as Batman she would just seem like a lame knock-off of the original. Also, in the pictures, the characters from the Spiderman 'verse (Spiderman and Venom) look exactly the same, just with different body types. Although I don't think there even IS a female counterpart of Spiderman (correct me if I'm wrong), if she looked that similar I would be a bit disappointed. However, the superheroines wearing the same costumes as the men does seem much more practical than the costumes they actually end up with, and I'm all for practicality in superheroes' costumes. I think that the comic would sell less because the main audience for the comics are young men and they fantasize with these super heroines and their sleazy costumes, but I totally agree that the less sexualized costumes look better.